Product prices and availability are accurate as of 2018-12-10 04:02:13 EST and are subject to change. Any price and availability information displayed on http://www.amazon.com/ at the time of purchase will apply to the purchase of this product. Gator Tool Bull Float includes Gator Tools Gator Glide 4 bolt Fixed Adjustable Head! Snap Button Extension Poles sold separately. Excellent wear resistance. Reduces surface closure, and the trapping of bleed water. Harder and stronger than many common concrete tools. All Gator Tools are Proudly Made in Milwaukee, Wisconsin, U.S.A.!. 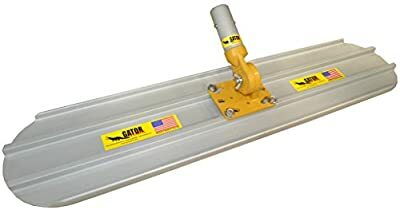 Includes Gator Glide 4 bolt Fixed Adjustable Head, poles sold separately Extra-wide rib spacing for added stability, superior strength and hardness Stays straighter, lasts longer Non-painted, naturally finished, "broken in" and ready for use Proudly Made in the U.S.A.!